The Honorable Judge Lawson E. Thomas, born January 28, 1898, was a tireless fighter for human rights. The Honorable Lawson E.Thomas (1898-1989) was the only African-American graduate from the University of Michigan’s Law School in 1923. At the graduation dinner he sat alone none of the other graduates would sit with him. The Dean of the school noticed Thomas was alone and sat down with him. Judge Thomas never forgot his “Grand Gesture”. It was a great honor for me to have created this pastel portrait of The Honorable Lawson E. Thomas Memorial Pastel Portrait. I remember sitting with his widow Mrs. Eugenia Thomas, at her kitchen table thinking how dignified and beautiful she was, even in her seventies. We sat for hours talking about their life and looking at a lifetime of family pictures. Her husband was able to achieve so much from such humble beginnings, having worked as a janitor while waiting for notice of his law school graduation. Eugenia Thomas and I had a wonderful afternoon that day and kept in touch every Christmas for many years. I was delighted that she approved of the portrait I created of her husband. Judge Thomas was the son of an Ocala Florida schoolteacher and his father was a mechanic. 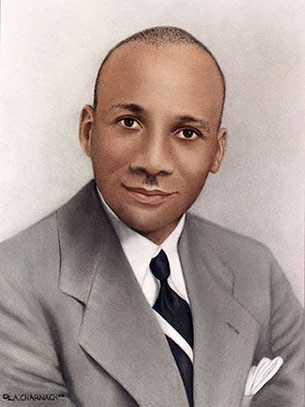 Judge Thomas graduated from Florida A&M University in 1919 and received his law degree in 1923. He practiced law in Detroit and Jacksonville before moving to Miami in 1935. He was one of the early leaders of the civil rights movement and represented plaintiffs in lawsuits requiring the registration of African-American voters in Duval County. He fought for the uniformity of the school year length in Broward County, the equalization of teacher’ salaries and the inclusion of African-Americans in jury panels throughout the state. He was a frequent collaborator with Thurgood Marshall and the NAACP during the long fight to roll back segregation and banish Jim Crow. He retired from the bench in 1961 and returned to private practice until he passed in 1989. I was commissioned The Honorable Lawson E. Thomas (1898-1989) Memorial Corporate painting that was unveiled, October 13, 2000 at the Lawson E. Thomas Courthouse Center, Miami, Florida. As a side note, at the time I created this pastel painting of Judge Thomas my last name was Charnack and since my marriage in 2007 I sign all my works L.A. Cline, my older works go by L.A. Charnack/Cline. A Fine Art Giclee Reproduction of the original Pastel Painting of Judge Lawson E. Thomas is now in the Smithsonian Institute in Washington DC, at their American Art and Portrait Gallery Library, in the “Living Artists File” as a referral for new commissions. This file can be viewed by the public to learn about our American Heroes and the Artists that created their images. This file also allows visitors to see the Artist works as a recommendation for future commissions.